On the eve of its major user conference this week, Google announced ambitious plans to expand the geographic scope of its cloud platform around the globe today. Google announced two new regions: US West in Oregon and East Asia in Tokyo, Japan, with plans to add 10 more regions at undisclosed locations by the end of 2017. 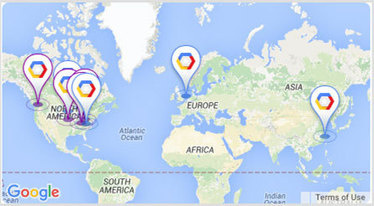 Google’s cloud now has six regions including Eastern US (South Carolina), Central US (Iowa), Western Europe (Belgium) and East Asia (Taiwan) with more to come. The announcement highlights how big IaaS public cloud providers like Google, Amazon Web Services, Microsoft Azure and IBM are in an arms race to build up data center capacity for their clouds around the globe. “We’re opening these new regions to help Cloud Platform customers deploy services and applications nearer to their own customers, for lower latency and greater responsiveness,” wrote Varun Sakalkar, a GCP product manager in a blog post announcing the news. By comparison, Amazon Web Services has 12 regions with plans to open four more. They include Northern Virginia, Oregon, Northern California and the AWS GovCloud in the U.S.; A Sao Paulo region in South America; Ireland and Frankfurt in Europe; and Beijing, Seoul, Tokyo, Singapore and Sydney in Asia/South Pacific. AWS has plans to add new regions in Montreal, Ohio, the United Kingdom, India and Ningxia (China). AWS and Google Cloud Platform (GCP) have similar architectures for their global cloud footprints: Both use the concept of regions and availability zones (in the case of AWS) or just zones (in the case of Google). Regions are areas that have multiple zones in them, each of which operate independently of one another. Customers are encouraged to deploy workloads across multiple zones to ensure that if one zone goes down that the application remains up. Spreading workloads across multiple regions provides even more protection. So, each of Google and Amazon’s regions have at least two zones in them, and zones (or Availability Zones) can be made up of multiple data centers. Microsoft Azure and IBM SoftLayer have somewhat of a different architecture. Microsoft has 22 regions for Azure around the world, with plans to add five more, but each region is not guaranteed to have multiple zones. IBM says that it has 46 cloud data centers around the globe, including its most recent in Johannesburg, South Africa – the first of the major cloud providers to offer a presence in Africa. Google announced the global data center expansion the day before the company kicks off its GCP Next Global User Conference on Wednesday and Thursday in San Francisco.